Getting Out There: Since most of you are writers, I’m guessing a few of you will identify with this: I dread going places. And the longer I write, the worse I get. Even an approaching dinner party can make me squirm with reluctance. Heck, I even dread going to the grocery store on a Saturday. I’ll take a non-crowded Tuesday morning, please. And as exciting as vacation travel can be, as the departure date looms, I am filled with dread. You have the packing, the passports, the parking, and dealing with people. There are airports, security checks, and dealing with people. There are hotels, tour schedules, and dealing with people. Have I mentioned that you have to deal with people? I guess I’m a bit like old Bilbo. “Sorry! I don’t want any adventures, thank you. Not Today. Good morning!” But once something (or someone) gets me out there (I don’t have a Gandalf, but I do have an adventure-loving wife), especially after a day or two on the road, my old curious, wandering soul tends to reemerge. The dread dissipates and is replaced by what darn near resembles an adventurous spirit. 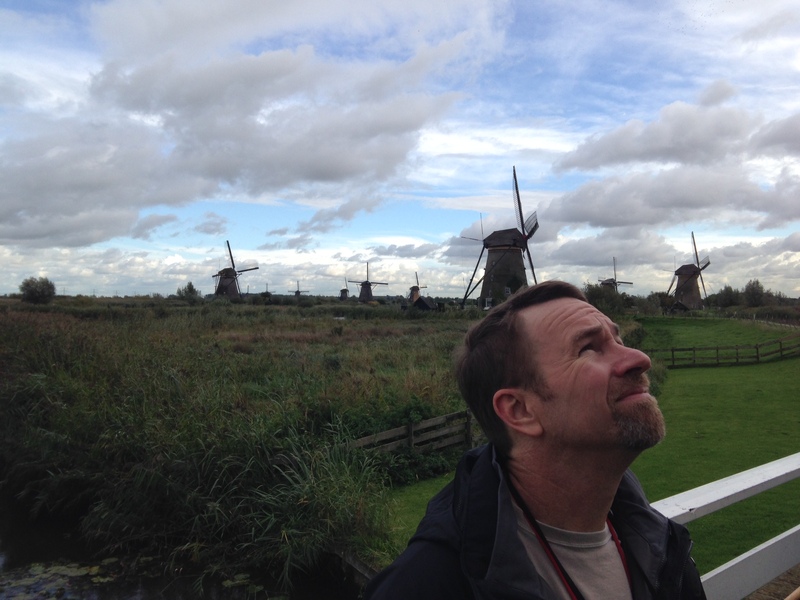 Such was the case on our last trip—a river-cruise on the Rhine River, from Basel, Switzerland to Amsterdam. And get this: the ship even offered second breakfast! That’s what I call traveling in style. One of the reasons we chose a Rhine River cruise was that part of my trilogy is set in the region (most of the first half of book three). Besides the second breakfasts, we also loved the idea of seeing such a vast swath of the heart of western Europe and only unpacking once. I’d done quite a bit of research in writing the segment set in the region. Traveling there let me know I’d mostly gotten it right; the slope of the river banks, the walls of the ancient cities, etcetera. But I knew from past experience, there’s nothing like actually being there and seeing it for yourself to sharpen your perceptions. I’m actually looking forward to the inevitable rewrite of book three, just knowing I can imbue the prose with even more of the region’s atmosphere. Now I’ve actually stood on the banks of the mighty river, and contemplated a cold-weather crossing. I’ve gazed across to the far hilly shore, perfectly comprehending what it might feel like to know a hostile force was probably hidden in the trees overlooking the far bank (chilling). I’ve seen the old Roman arched gateway of Cologne—Colonia Claudia Ara Agrippinensium in those days—and walked the original square. 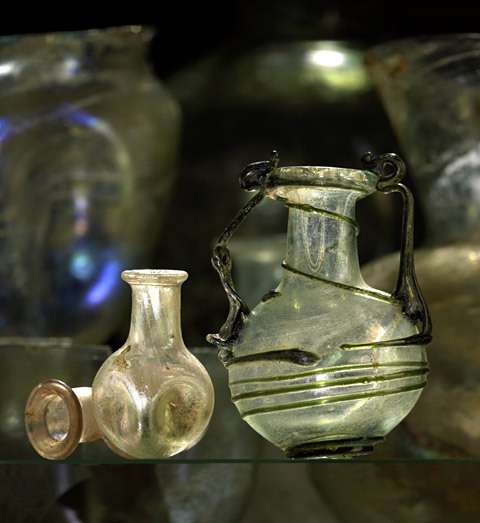 I’ve seen the ornately-decorated, colored wine glasses and flagons used by the colony’s merchants and administrators (seen while touring Cologne’s Römisch-Germanische Museum, which was one of the highlights of the trip for me). I know from experience that the infusion of carefully placed details can breathe new life into the work. As wonderful a tool as the internet can be, there’s nothing quite like being in a place to sense its history. Guiding Lights: I used to disdain guided tours while traveling. I used to think I was better off discovering a place on my own. I was a traveler, not a tourist, damn it! Tour guides were for blue-haired ladies and multi-camera-toting, sunburnt nerds. Now that I’m older (and a multi-camera-toting, sunburnt nerd), I’ve grown an appreciation. Particularly for a really good tour guide. One of the first times I realized what a resource a guide could be was on a tour of Pearl Harbor and the USS Missouri. Here was a man who could point at the ground to show us where he was standing, at the age of seven, when he realized the attack was on. He then pointed up to the mountainous horizon as he told us where dozens of Zero fighters and Val carrier bombers came into view. The emotion was still fresh on his face and in his voice as he described first seeing the Japanese rising suns on the wings, and hearing the first rattle of machinegun fire. I can still clearly recall the tour, over ten years later. Jack the Welsh tour guide. And good tour guides abound. Some better than others, but there is always something to be learned from each. This trip was no exception. To name a few, we had Jack in Colmar, Alsace—a Welsh expatriate, fluent in French and German, with a tremendous grasp on the region’s history and culture, delivered with passion and humor. Then there was Franco in Cologne, whose knowledge of the cathedral and its history seemed an expertise that could not be topped—until we went to the Roman museum and he warmed to the topic of the Roman colonial era in the region. So when the opportunity arises, don’t be too cool for school. Take the tours. Listen up and ask questions. You are bound to learn from those passionate enough about their area to put up with the likes of us sunburnt nerds. And don’t forget to tip! One of the things I dread about cruising is that there are bound to be other passengers. Have I mentioned my reluctance about dealing with people? And yet, I am always intrigued. For a writer, travel is a wonderful people-watching opportunity. 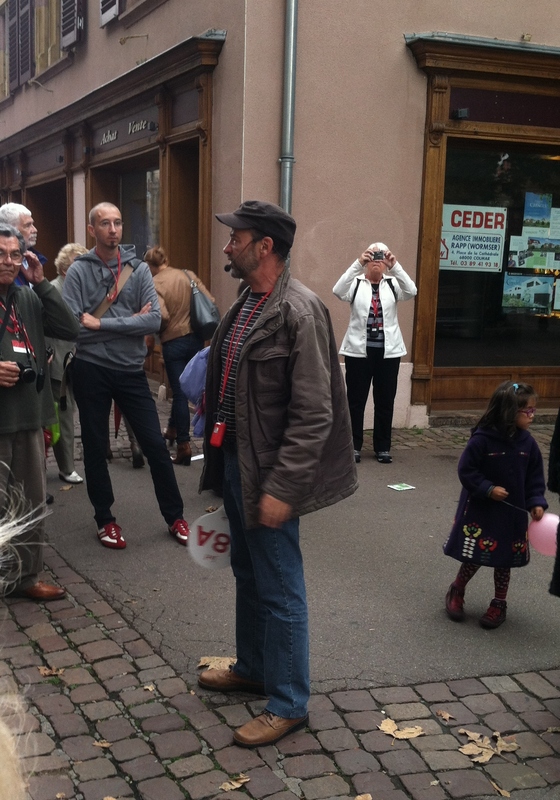 And we met our fair share of interesting folks on this trip. For example, there were the sisters traveling with their mother, revisiting Germany for the first time since their German father passed. We’d gotten friendly onboard, and they already knew I was a writer. Over a traditional German meal (and quite a bit of German wine), it came out that their father had written a book—a memoir. Turns out he had been in the Wehrmacht during WW2. He was not a Nazi, and was forcibly drafted into service as a boy, toward the end of the war. The book was about not just his experiences in the war, but the aftermath—living in a postwar world as an ex-German soldier. It sounds fascinating, but I’d have never learned of it if we hadn’t spent a week, and several meals (and no few cocktail hours) with these interesting folks. There are also the people you encounter at every stop and on every outing. Not just the guides, but the shopkeepers, hotel and museum workers, fellow diners, even waiters and waitresses. Even very brief conversations (often with the difficulty of language differences) enhance the experience of being abroad. It’s always fun to tell people that we are from Chicago while traveling abroad (we actually live in SW Michigan, but Chicago is the nearest city). I often get the sense their image of Chicago is one of heavy industry, gangsters, and corrupt machine-politics. Which gives me a better insight into my own worldview. There’s more to travel than the specific things you learn or the pictures you take. There is a gained sense of worldliness. It’s inspiring, and as exhausting as it can seem in the short run, it’s ultimately revitalizing. Travel renews our sense of wonder. As author Bill Bryson says in his book, Neither Here Nor There: Travels in Europe: “[This is the] glory of foreign travel, as far as I am concerned. I can’t think of anything that excites a greater sense of childlike wonder than to be in a country where you are ignorant of almost everything. Suddenly you are five years old again. You can’t read anything, you have only the most rudimentary sense of how things work, you can’t even reliably cross a street without endangering your life. Your whole existence becomes a series of interesting guesses.” I can vouch for the danger of street crossing, particularly in France. Our Welsh tour-guide Jack warned us that the French used their brakes as if each application depleted a finite and precious resource. Just like reading a good book, travel is an immersion experience, and is bound to broaden your perspective and your worldview—which can only be a good thing for us writers, right? So if you’re a reluctant traveler, like me, do yourself a favor, and step out onto that road. The odds of being swept off your feet are much better than if you stay holed up in your writerly den. Your turn to embark. Has travel influenced or inspired your work? Where are you off to next? This entry was posted in The Writing Life, Uncategorized and tagged Rhine River Valley, Travel as inspiration, travel as writing research. Ah, good, another reluctant one. You’re right about overcoming the inertia. Then things can really start to roll. 🙂 Thanks, Brin! Sounds like an amazing trip! Your leaving the house phobia sounds like mine (if you add on two kids, one of whom has a knack for finding trouble). I’m so glad you had a wonderful time, and so glad you are back! I don’t think I’m becoming agoraphobic, or anything, but I’m much more interested in a long walk in the woods than a trip to a store or most social gatherings. But once I’m out and about, I do pretty well. It’s also nice to be home again afterward, isn’t it? Thanks, Liz! I’m so glad you’re having an enriching time! Such a wonderful experience you’re having. I LOVE to travel– love experiencing the culture and all the icons of the culture. It’s bliss for my soul. I was thinking about the cultural stuff I didn’t mention in the post. There’s so much to be gained in trying the food and hearing the music, and shopping in the markets, etc. You’re right, Julie, it’s all nourishing to the soul. Thanks! Your description and my memories of books one and two meshed and brought the visual to life. It sounds like soul food. I can totally relate to the wearisome and wary feelings for leaving what is easy and comfortable, but as you say, every moment of preparation is well worth the outcome. Our German guide at Heidelberg (a smart and funny student) was telling us about Twain’s time in the city (which it sounds like he loved as much as I did). Twain’s remark about his attempts to learn their language: “Life’s too short to learn German.” And it seems even more true today, as we met almost NO Germans who spoke no English. Most seemed fairly fluent.Almost all knew we were Americans before we even spoke (which somehow mildly offended me–must’ve been my tennis shoes, not my waistline 😉 ). Great post. Travel is one of the best ways to learn because every sense is open and absorbing what’s around you. I actually love to travel, though I tend to be much more hermit-like the rest of the time. I’m subject to panic attacks in crowds with the exception of two circumstances: when I’m traveling (perhaps its the wondering-kid thing Bryson talks about), or when I have some sort of official role (leadership,etc.). Go figure. I can say that I’ve never been so happy as the times I’ve traveled in Ireland. I’ve also lived in a gaeltacht section. Perhaps there’s something about swimming in your own gene pool. I had to laugh about crossing the street. In Dublin they have “LOOK LEFT” painted on the pavement on all the corners because of tourists having trouble with which way the cars come. I must say, I felt your “swimming in your own gene pool” thing there. Although I LOVED Ireland when we were there, that’s my wife’s gene pool. My father’s family traces it’s roots to the upper Rhine region, and my mother’s side from Rotterdam, in the Netherlands. So we went from my paternal ancestral stomping grounds to my maternal, all in a bit over a week. 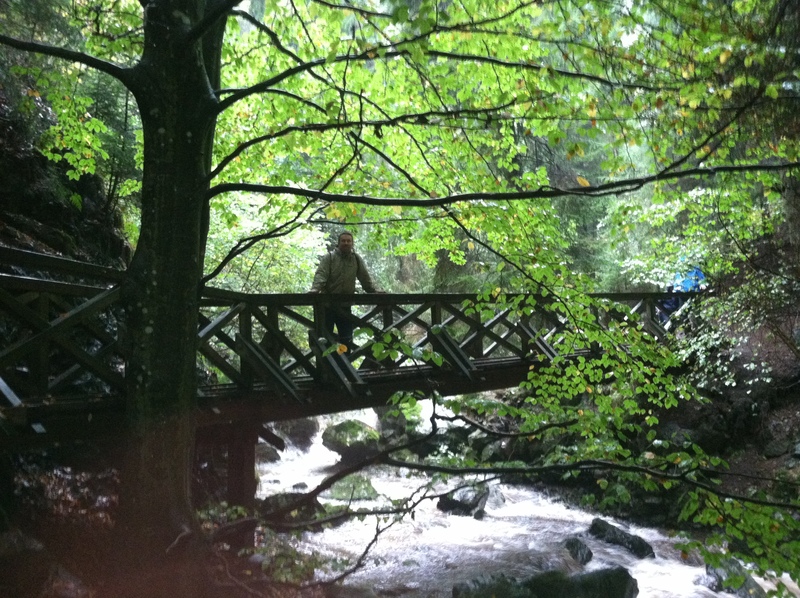 I was particularly moved by that hike in the Black Forest (the bottom picture here). It really stirred my soul! Oh boy, what an encouraging post. I can certainly relate to the pre-travel anxiety. I’m off to a writing retreat in a few days in a place I’ve never been among people I’ve never met talking about my novel…in public (!). So glad you had a great time. I love it when real life works in conjunction with our writing. Oh, how exciting, Christi! Hoo-boy, I can only imagine how you must feel, facing travel, meeting new people PLUS sharing about your work in public. But I am positive you’ll be great! 🙂 Thanks for sharing! Safe travels, and have a blast! I was wondering how your travels were going, other than the occasional status updates on Facebook. This was very nice to read, and an excursion that really brings out the green-eyed monster in me. Of course, all in a good non-covetous way (ha!). The landscape is gorgeous and so old-worldly. Love it. I’m getting away for the weekend—that’s about the best that I can do right now—but it’s a perfect mini-retreat for me. Camping with some friends and relaxing…not having to worry about anything besides putting on bugspray. No matter where I go, my lizard eye scours the details 360°, so all my travels influence me to some degree, whether it be by observing the old lady on the park bench crocheting a grandson’s scarf or the pigeons pecking at the spilled crumbs from her sandwich bag. I’m glad you’re having a wonderful and inspirational time. Great post, Vaughn, and wonderfully written. It was an excerpt worthy of Fodor’s. I’m glad you’re getting away, Mike. I know your due for a bit of replenishing. And a nice relaxing trip with friends is often the just the ticket! Thanks for your kind words, Mike! Keep that lizard eye peeled, but don’t forget to soak up more than just bug spray (sunshine, good food and drink, friendship, relaxation, etc.) Have a blast! Thanks, Heather! I know you and the other mods had a busy week on the page while I was gone. Thanks for covering me! I appreciate you, my friend. What an exciting adventure, and great pictures! I’m so happy for you that you had this opportunity not only to spend some time with your wife, but to be immersed in the actual physical world of your story. I would really like to travel to Maine, Portland in particular, as well as one of the islands off the coast, since my current work is set in that area. My husband and I have talked about it for a couple of years but never seem to have breaks at the same time! Soon I hope. 🙂 Thanks for sharing your experience. As a fellow lover of Northern Michigan, I can attest that you’re going to love Maine, Nicole. It’s like your area but with rocky coasts. The best of Maine is much like the best of Michigan turned up a notch. Plus there’s the lobsta’ rolls (rather than fudge). It was a special trip, and I know yours will be, too. I’ll bet it’s pretty gorgeous in your neck of the woods about now. Wish I could come visit. We’ll be up just before Christmastime, though. Hope to see you then. Thanks, Nicole! I love travelling but have developed a fear of flying that makes anywhere I can’t drive an anxiety-filled option. I wouldn’t let it stop me from going somewhere I truly want to go, but I have to be pretty determined to get there! When I started the Age of Stars I had a lot of trouble writing setting because I’ve never been to Yale University or Boston, or any of the locations in Europe where I had plotted the story. I was able to find a walking tour on the internet of Yale, but I felt blind because I didn’t know what the places sounded like or how the air felt. There is so much sensory experience that, if we visit a place, we can hopefully wrap into our stories. What a great way to describe the ancient forests–feeling so magically different that they *had* to become an alternate story world. I agree. Every time I’ve been in one, I’ve felt that magic. I know what you mean about looking at pictures and reading about a place, not quite cutting it. But I know that your version of the settings will be what readers will connect with (see B’s comment below). I have developed, shall we say: “an extreme reluctance” to long flights. So I feel you. The only thing that makes them tolerable is that it’s great, semi-uninterrupted reading time. Thanks for reading and enhancing the conversation, Lara! That’s an amazing picture, that village by the river at the start of your post. It’s a perfect example of a picture worth a thousand words. The stories just tumble with the rocks loosened from the old stone buildings. I agree travel broadens our horizons. But you know what I’ve started to notice? It’s not so much the place that brings the story, as what happened while I was there. For instance, I almost got arrested once for tombstone rubbing, along with my ten-year-old at the time daughter and her tutor. It was in Atlanta, Georgia at a cemetery where the residents were so materially well-off when they departed this existence that they had copyrights on their tombstones. Yeah. Go figure. I almost got busted for copyright infringement on a tombstone. How crazy is that? I also believe that parts of the world we see through the eyes of the writers and their books that have made those regions come alive. Having been lucky enough to read your trilogy, I know that area of the world to which you just travelled shall remain for me colored by the stories you brought to it. Blessed be your journey. I loved that old postcard as soon as I saw it. 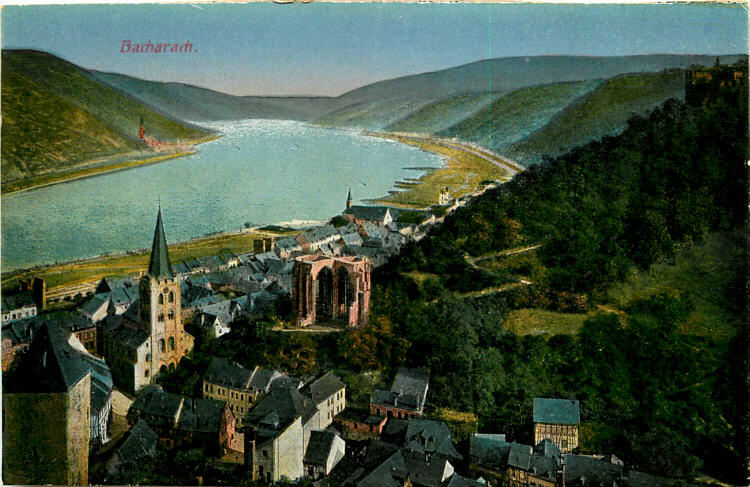 I can picture the village of Bacharach perfectly, with its Roman arches in the town square. But I didn’t have a photo that evoked the magical air of that area (plus, now there’s a busy railroad running along the river, and cars, etc.). What a wonderful post, V. Your words led me into yet another daydream about the traveling I hope to do one day. I have chronic insomnia, and one of the tricks I’ve learned is to lose myself in an extensive daydream- whether it’s the story I’m revising, my future self as a published writer (hey, it gives me the mojo I need to keep going some days! ), or the wondrous experiences I want to have in far off places. I love reading travel blogs, posts like this, and I have a good friend who is happy to share her adventures with me. After my grandmother, the last of my grandparents, passed away last week, I learned more about my heritage- a glorious cocktail of Irish/German from my mother’s side, and English/Native American/ Italian from my father’s side. Something blissful stirred up within me. I’m very hungry to better know my ancestors, and what a journey it will be. My imagination is already full of the stories my families are telling, and my own conjuring of romances and choices that lead to what my family is now. I was also reminded that my grandmother was an English teacher, and learned that my poetry comes from her- she wrote a poem last year, before she became very ill, that I’ll carry with me for years to come. Having said this, yes, I agree, travel is good for the soul and I look forward to the time when it can sweep me off my feet and teach me more, not only about my ancestry, but the spirit of people in general. First, so sorry to hear about your grandmother. Hugs to you. I know pondering my own heritage played a big role in my writing journey. I read a distant cousin’s genealogy treatise right before I started, and it really got me thinking. Prior to reading her speculative origins of our family in Europe, my trilogy was always going to be a “New World” adventure. I always loved American Indian stories, and wanted to bring the epic fantasy genre to an alternate version of a wild North America-like setting (sounds like you might have some digging to do on this side of the Atlantic, too). Then my distant cousin set me on a course of research that changed everything. She traced our ancestors back to the Germanic Palantines–and the German protestants in the upper Rhine region’s mass flight from the French in the aftermath of The War of Spanish Succession (1701-1714), first to Amsterdam, then to England, and finally to America (specifically Germantown PA). She went on to speculate that my forefathers had been descendants of the Visigoths, who had been granted the lands they were dispersed from by the last remnants of the Roman imperial government. Long story not so short, whether it’s true or not, everything changed after I read it. And I did feel my soul stir in that Palatinate area of the Upper Rhine Valley. I do the exact same thing while trying to fall asleep. My current nighttime comfort is created by plotting my next work. It’s really soothing to me, which my wife thinks is a bit weird–like that would keep me up rather than lulling me to slumber. I’m glad I know someone else who does it. That’s very cool about your mom’s poem. Good luck charting your ancestry! Thanks for sharing, and again, my condolences to you and your family, Tonia! What a treat to read this (and to see the beautiful photos). I laughed out loud when you spoke of “having to be around other people.” I get worse and worse about that as I age. Of course when I finally get to meet YOU, I’ll be thrilled. Thanks for sharing the lovely words and images. The WU conference next year is one where I am truly looking forward to dealing with people. But I’m pretty sure our freak flags will be welcomed. Can’t wait to meet you, Sarah! Thanks, so glad you enjoyed the post! Have a great weekend! My most memorable travel experience was the two weeks I spent in my Mom’s hometown in Lansford, PA, heart of coal mining country. While I was there, I met up with a guy from the historical society, and he was my personal tour guide. I learned so much from him, and he took me to places I didn’t know about. The experiences in Lansford will indeed be in my short stories. I wish I could afford to travel more – I’d be on the road every couple of months. I was invited to speak at a convention in Wilkes-Barre, and the company that hosted it sent me on a tour of the coal mines. I’ll never forget it. I was the only tourist, with two guides (one from the company–a local–and one from the historical society). As was yours, it was truly a fascinating day! Thanks for reading and commenting, Karen. Wishing you happy and safe travels! Wilkes-Barre – been there too! A coal mine is a spooky place. It was for me anyway – especially since I happened to take a picture of a ghost. I didn’t realize it until later that night, sitting in the tiny motel room, downloading pictures, and there it was – a face, in misty fog – in the picture. I slammed my laptop, it freaked me out! Then I thought, hey, maybe that’s great-grandfather James or grandfather Richard, come to say hello. Gives me chills to talk about it though. I cannot imagine young boys – as young as my grandson Wayne, 8 y.o. – working in a place like that. Those mines are definitely spooky! What a cool story–perfect for this time of year. I’m with you–can’t imagine what those poor boys and men have endured, and still endure. Working down there would be a nightmare for me. The thought chills me to the bone! Sounds like an amazing trip! Like you, “I dread going places. And the longer I write, the worse I get. Even an approaching dinner party can make me squirm with reluctance.” I could’ve written those very words, in fact. That said, I absolutely love travel and as a child I traveled pretty extensively worldwide and lived in some remote places — this has filtered into my writing in almost every possible way. I don’t have any trips planned, but I hope to go someplace European next, and you’ve given me some great ideas! Thank you! I thought there might be a few of us who could identify with the dread. 🙂 That’s cool that you’ve done a lot of traveling and lived in some remote places, Julia. It really feeds the writer inside, huh? I know this trip fueled up my writerly tank. I highly recommend river cruising, if that figures into your travel plans. I’d do it again in a heartbeat. Thanks, Julia–have a great Sunday! Would’ve loved to have you on the trip! As I told you on your wonderful WU post (here: http://writerunboxed.com/2013/10/20/the-isolated-author/ )–my better half (thankfully) drags me out into the big, wide world once in a while.